Conference participants are responsible for their own accommodations. We are negotiating special room rates with local hotels and our on-campus residence halls. The number of rooms at both are limited, and you are encouraged to reserve your room in a timely manner. For those staying at the conference hotels, we will be providing a shuttle bus to and from the Imin Center each day of the conference. 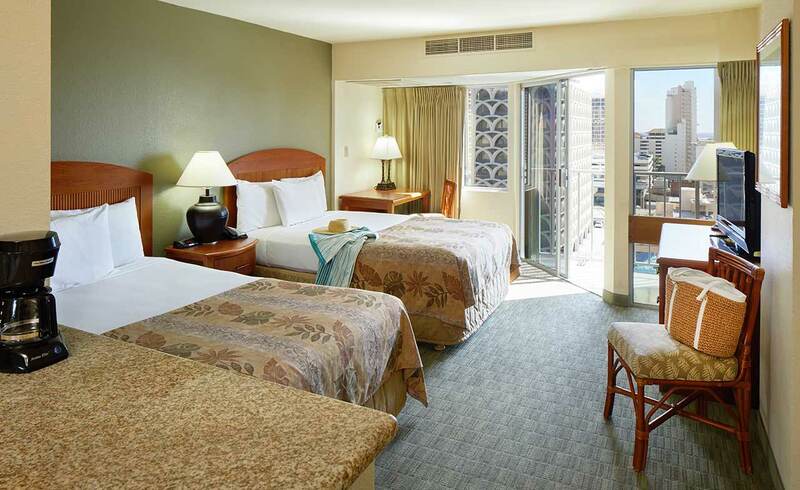 All rates are subject to Hawaii State Excise Tax of 4.712% and Hotel Room Tax of 10.25 % for a total of 14.962%. NOTE: Please be advised that the rooms are on the small side, especially the Standard Room (199 square feet). 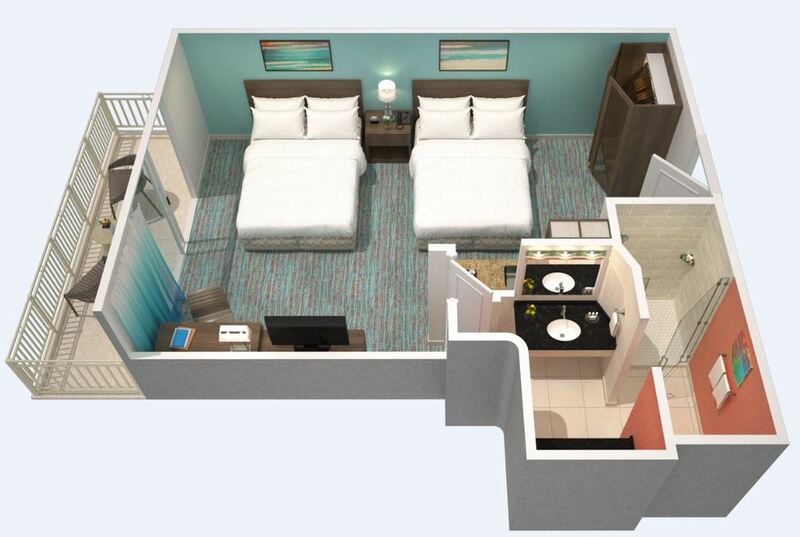 The Deluxe Rooms are 275 square feet (290 square feet for rooms with double beds). For full details on what the hotel offers, see their Fact Sheet and room layouts. Available dates at the special rate: February 24-March 5, 2019. [Please note that our special rates are also good for up to 3 days before (February 21) and 3 days after (March 8) this period, provided rooms are available. The online form below can handle reservations during the main block period, February 24-March 5, 2019. If your stay will extend beyond those dates, please contact the hotel directly to check on availability and to get the special rate for the extra dates. Please mention our group name: "ICLDC"
159.00 USD per night - Waikiki View Room (single or double occupancy, 1 king or 2 double beds) - Additional fees apply if extra people staying in room (3-person rate is $199 per night for the room; 4-person rate is $239 per night for the room). Family Plan: 17 years and under are free when sharing a room with their parents, utilizing existing bedding. Parking on a space available basis. Parking for 15-passengers vans not available. Any cancellations between 60 and 45 days prior to arrival, the hotel will charge a one night room and tax per reservation cancelled. Any guest rooms cancelled within the 45 day mark may be charged up to two nights of their room and tax. Available dates at the special rate: February 24-March 5, 2019. [Please note that our special rates are also good for up to 3 days before (February 21) or 3 days after (March 8) this period, provided rooms are available. If they are not available for certain days, you may need to adjust your search accordingly. For the budget traveler, the East-West Center Residence Halls provide affordable on-campus accommodations. Each residence hall has a reception desk to provide check-in and check-out services. The desks also take messages, provide change for laundry and vending machines, issue spare keys, and provide general information. Air conditioning is NOT available in any of the East-West Center residence halls. If you are interested in staying at one of the three residence halls, please contact the East-West Center Housing Office directly to make your reservation. Be sure to mention that you are an "ICLDC" Call-In group member" so you can get the special rates. Please make your reservation as early as possible for your best chance at getting a room. They fill up quickly. Lincoln Hall is a four-story building serviced by one elevator. All studios ($56/night) have cable TV, telephone service, internet access, and private bathroom/toilet facilities. 1-bedroom units ($80/night) also have a kitchenette. NOTE: Lincoln Hall is currently full, but dorm rooms in Hale Manoa and Hale Kuahine are still available (see below). Hale Manoa is a 13-story dormitory serviced by two elevators. Single dorm rooms are $32 per night. Double dorm rooms (2 single beds) are $43 per night. Linen and bedding are provided; however, guests must either bring towels or purchase a towel packet (bath towel, wash cloth, and small bar of soap) at the Front Desk. All rooms have telephone service, internet access, and shared bathroom facilities. Limited kitchen facilities and coin-operated laundry machines are located on each floor. In addition, residents have access to lounges for TV viewing and social gatherings. Hale Kuahine is a four-story dormitory with no elevator. Physical arrangements and rates are similar to Hale Manoa. Late check-outs will result in a one night's room charge. Need help finding your way around campus? Check out this map. The map is best viewed in Adobe Reader or Acrobat.